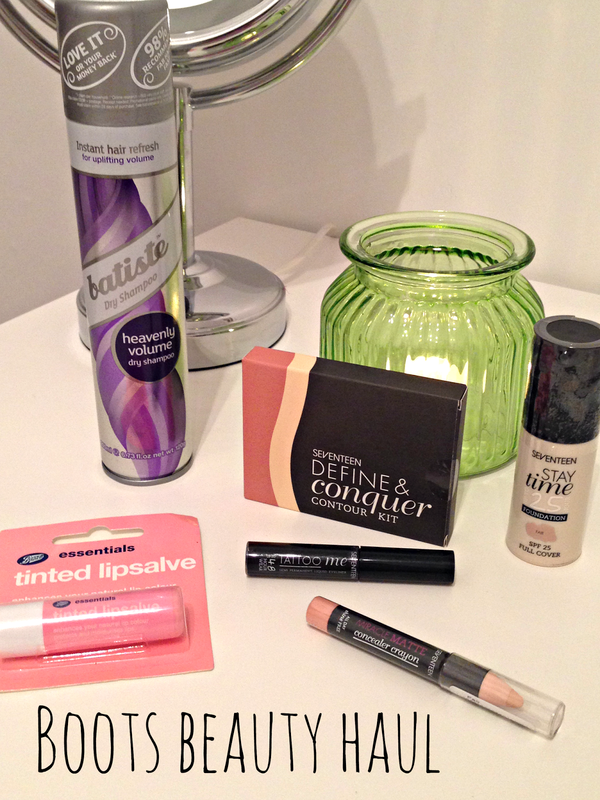 Payday Boots Beauty & Make-Up Haul! I'm not sure about you guys but when it's nearing payday, I slow down my spendings and tend to only buy the things that I reallllly need. Like wine, obviously. Normally in these weeks though, of course as if it can sense that I'm skint, all of my make-up starts to run out so when payday finally comes around, I'm getting to the point where I'm scrapping the last remains out of the bottle. As soon as I was paid this month I was straight down to my local shopping centre to stock back up and of course, just my luck they didn't have my foundation shade in stock. FML. Because I'm stubborn and HAD TO HAVE that foundation, I decided to order it online when I got back but as they had a lovely buy one get the second half price offer so I ended up spending a lot more than what I originally should have. Oops! The foundation that I'm really loving at the moment is the Seventeen Stay Time foundation (review post here) and since I was running low so I decided to re-purchase. I went with a lighter shade this time which I think actually works a lot better with my skin tone. To go along with my foundation, I also picked up their Miracle Matte Concealer Crayon in Light. I've tried Seventeen's Phwoarr concealer before (review here) and I really enjoyed it so I thought that I would give it a try plus it helped me complete a buy one get one half price offer. Carrying on with face products I also treated myself to their Define and Conquer Contouring Kit in Light. I never really got into contouring phase as my attempts were normally pathetic but since little duo was a bargain for only £5.99, I thought I would give contouring another go and hopefully I'll be able to look amazing like everyone else who does it! Last in my Seventeen haul, I picked up their Tattoo Me Semi Permanent Liquid Eyeliner in Black. I've tried to buy this several times in store but they've never had in stock but since I was ordering a few things and once again a product short of the buy one get one half price, into my basket it went! I'm the kind of girl who feels uncomfortable if I don't have at least 2 cans of dry shampoo as back-up and since Batiste Heavenly Volume is a can that I've never tried before, I couldn't not add it to my basket. I tried their XXL Volume can and loved it but I'm not too sure on what to expect with this one. Won't it be the same? Lastly I brought Boot's essentials tinted lip balm for only £1! Like dry shampoo, I love having multiple lip balms floating around the house and I really couldn't resist a good bargain! Ah I still haven't tried out the Batiste dry shampoo, heard so many great things about it.. Have a great weekend..